Teletha "Tessa" Testarossa is the clumsy but charming Captain of the revered TDD-1 'Tuatha de Danaan' submarine of the anti-terrorist organization 'Mithril'. She is American by birth but has lived on submarines and military bases for the majority of her life time. 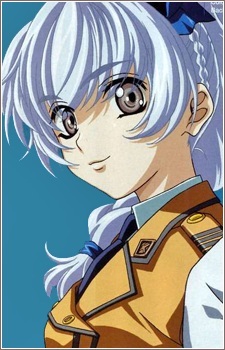 She is a child prodigy who rose to such a high rank at the age of only 16, has silver hair and grey eyes. Later revealed as being a Whispered, her high level of mathematical and scientific adeptness is dwarfed only by her brother's, which seems to have given her a sense of inferiority. She is also not very athletically inclined, but has shown to be a very good swimmer. She has an interest in Sousuke that extends beyond a professional one, generating a love triangle she shares with Sousuke Sagara and Kaname Chidori. Even though Chidori and Tessa seem to compete against each other for Sousuke, they are good friends in reality, as during several episodes they talk about Sousuke and his unique military charm. Tessa is also one of the chief designers of the TDD-1 'Tuatha de Danaan', and the creator of Dana, the submarine's Artificial Intelligence. Tessa has a lot of interesting qualities. Her subordinates are what she cares with the most. She is also very smart when it comes to battlefield tactics and conflicts and she displays some very impressive military prowess and strategy at several points. She also seems to have a nervous habit of playing with her ponytail. Sometimes however, as stated by Kurz Weber, "whenever Tessa was told by someone she couldn't do something, she made it a point to prove them wrong". Tessa seems to have some trouble tolerating her job at times due to the position she has. Some scenes have shown her irritated by what she does while other scenes show her slightly depressed by it. Nevertheless, she seems to have a large amount of stamina, and is able to cope with the stress of her tasks, and does a wonderful job doing so.